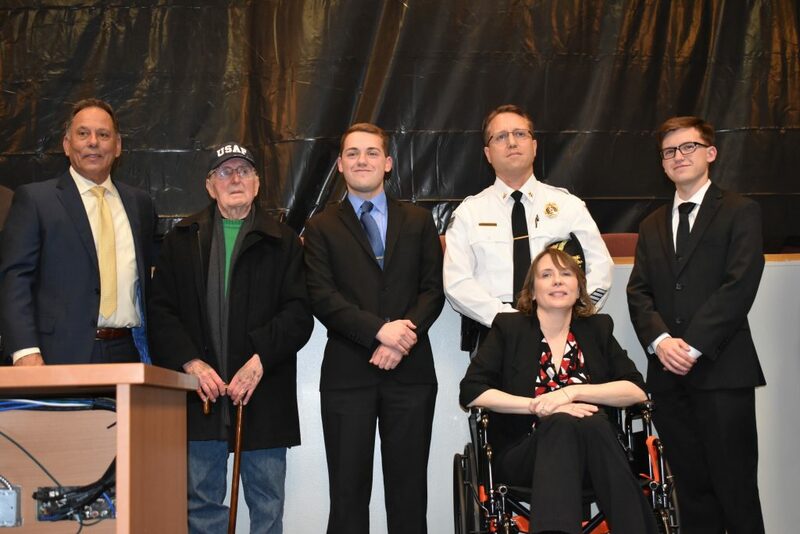 Kevin Pancoast placed his hand on the Bible, raised his right hand, and repeated the words of Deptford Township Mayor Paul Medany with his sons flanked by his side. 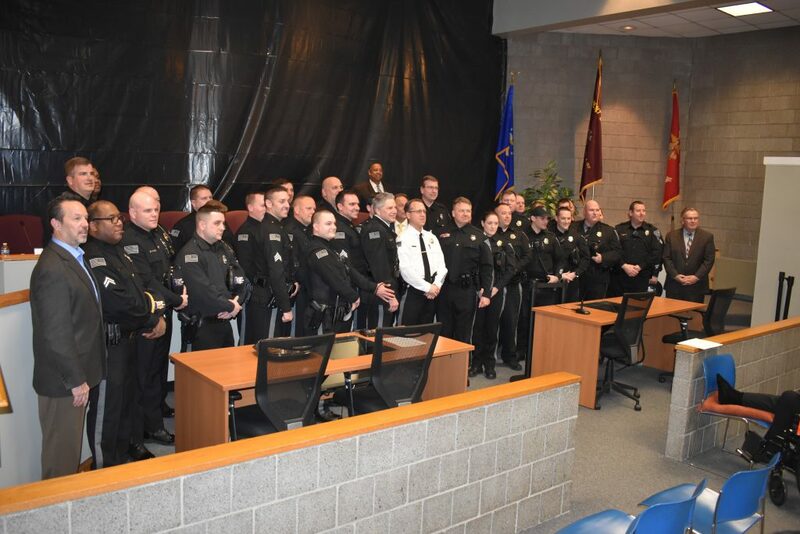 Later, both of his families, the ones that share his name and blood and the ones that are a part of the same police force, came up to the dais for a series of group photos. In between, Pancoast, the newly sworn-in Deptford Township chief of police, had someone specific to thank. The standing room-only crowd erupted in applause for Pancoast on a night he likely won’t forget anytime soon. 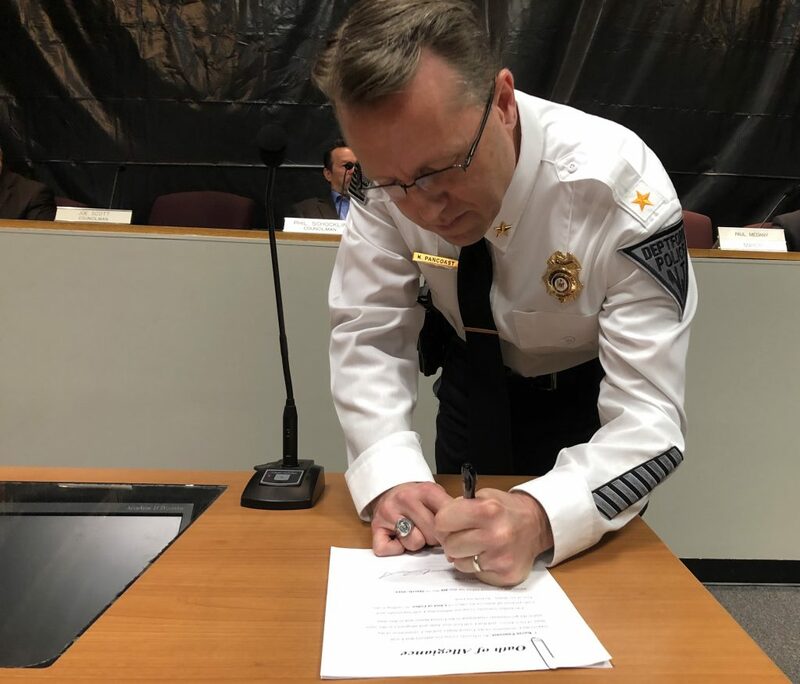 A veteran of the Deptford Police force for 25 years, Pancoast officially took over as the department head on Monday, March 4. He succeeds William Hanstein, who retired after 32 years on the force, including the last 5 ½ years as police chief. Hanstein stood in the back of the room and cheered on his former long-time co-worker, flanked by more than 50 other men and women in police uniforms. Fellow public service officials and friends filled the seats inside the township’s municipal building. The front row was populated by Pancoast’s family: his wife, kids, siblings, and his mom and dad. The younger Pancoast joined the Deptford Township Police Department in 1994. He worked as a patrolman, then as a K-9 officer for 12 years, then onto the role of patrol sergeant before graduating to a detective sergeant in the detective bureau. Pancoast has been a detective lieutenant since 2012; he was promoted to captain last year. With a new title come new responsibilities. Chief among Pancoast’s goals for his new position is to continue to make strides in community policing, something Hanstein made a priority in the last half dozen years. Before he headed out the door on his first official night on the job, Pancoast said he didn’t have any big parties or dinners scheduled. He was happy to keep the celebration low-key. The highlight of the night came earlier, when he let his eyes take in the crowd of family, friends, and fellow officers, and realized it was an appreciation for a career done right.